These ultra-soft fan gaskets are designed to reduce the vibration from cooling fans, and maintain a seal between the case side and the fan housing. The OEM packs contains a total of 32 gaskets. These super-soft, super-thick silicone fan gaskets are the softest, thickest and most effective fan gasket available. They are much thicker than any competing product we know of, and are designed to dramatically reduce the vibration from any PC or server case cooling fans. The 60mm gaskets are 1.5mm thick, and the larger sizes are 2.5mm thick. Included with each gasket are silicone washers and anti-vibration screws. These screws feature a unique thread design which prevents the shank touching the fan and vibrations being transmitted and amplified through to the chassis. The result? Much less noise! Help to absorb the vibration that otherwise would be transmitted from the fan into the case chassis and case housing. Help to ‘seal’ the small gap between the fan and the casing/enclosure wall. This improves the efficiency of the fan, by reducing feedback airflow and therefore air pressure losses. Technical Drawing of 120mm Silicone Fan Gasket. The silicone for the gasket is 2.5mm thick, and the silicone for the washer is 2.0mm thick. These gaskets are suitable for the vast majority of case designs and fan combinations, as they fit standard fan mounting holes. 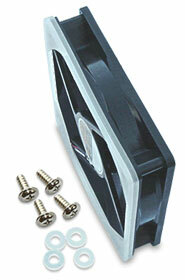 Slightly lengthened (12mm thread) fan mounting screws are supplied with the fan gaskets and washers. These gaskets can be used with standard PC cooling fans, and not just with AcoustiFan™ quiet case fans. Note: Do not use these gaskets in very high temperature locations inside a PC/Server such as attached to CPU or GPU heat sinks! Tighten the screws enough to very slightly compress the silicone rubber. Do not overtighten. Animation showing a vibration-reducing silicone fan gasket fitted to a standard case cooling fan, and fastened into position with a screw and external silicone washer. Effective? - Yes, these are simply the most effective yet! Why are these silicone fan gaskets especially effective? Because Acousti Products have not held back on the silicone thickness and the silicone material softness. We are confident that these gaskets are more effective than any other models available. 120mm case cooling fan fitted with Silicone Fan Gasket. This silicon gasket is 2.5mm thick. Silicone washers and mounting screws are also shown.